Fiddlesticks is a high sustain jungler with even higher teamfight presence. 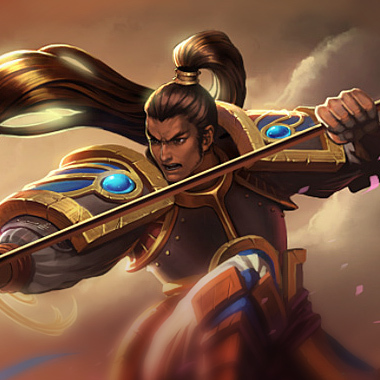 He comes packing the highest damage (Potentially) ability in the game, in a full channel Drain, and a respectible amount of CC with his ability to both silence and fear his enemies. His ultimate, Crowstorm, makes him a walking area of damage as he gifts his enemies periodic pain simply by being near them. Standing still or channeling for 1.5 seconds grants bonus movement speed, that lasts for 1.5 seconds once he starts moving. Being immobilized will not trigger Dread, and will reset the timer. Fiddlesticks causes the target enemy to flee. Fiddlesticks tethers himself to the target enemy and channels for up to 5 seconds. 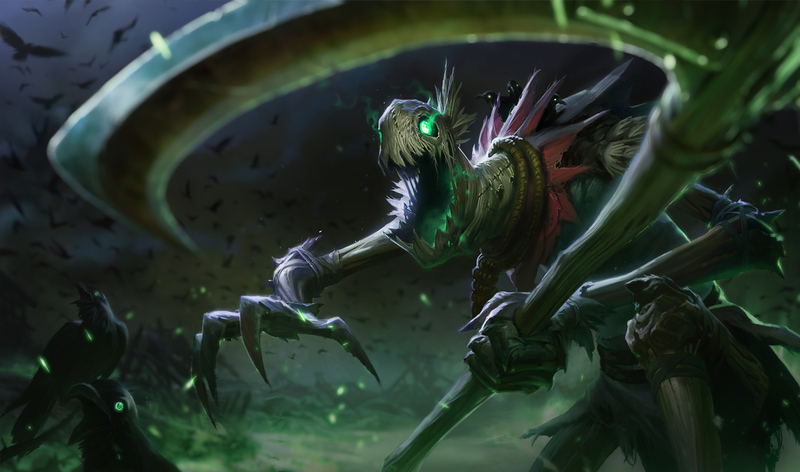 While channeling, Fiddlesticks deals magic damage each second, and healing himself for a percentage of the damage done. If the target breaks the tether by moving out of range, Drain ends immediately. 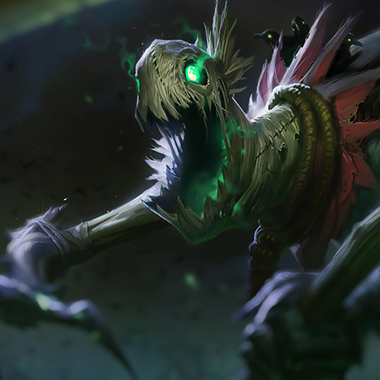 Fiddlesticks sends a crow to the target enemy that bounces to other nearby enemies up to 6 times, prioritizing targets not yet hit, dealing magic damage with each bounce and silencing them for 1.25 seconds once. Minions and monsters take 50% additional damage. After channeling for 1.5 seconds, Fiddlesticks blinks to the target location with a murder of crows flying wildly around him for 5 seconds, dealing magic damage to nearby enemies each second. Hard CC Is invaluable against Fiddlesticks. 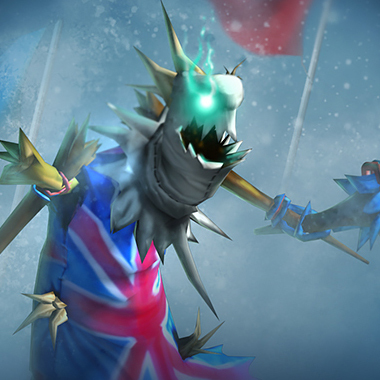 Both his Drain and Crowstorm are channeled abilities, which means that they can be interrupted by Hard CC. 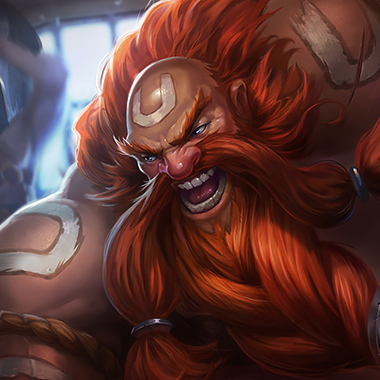 Long range stuns, snares, and knockups all make Fiddles life hard by interrupting his ultimate or drain. Fiddlesticks is just as fragile as he looks, consider any CC landed on him alone a pick, because without Zhonyas he won't survive very long and even that it just going to be delaying the inevitable in a lot of cases. Fiddlesticks needs level three to even hope to fight Xin, and then has to pray that he doesn't show up while one of his abilities are on cooldown, otherwise Xin will just invade and kill him. 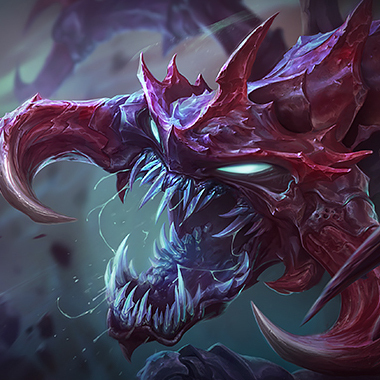 He can interrupt both of Fiddlesticks channel abilities and remove him from his team via his own ultimate, nullifying him entirely. He just denies Fiddlesticks his channeled abilities and eats him. He isn't a strong as Fiddlesticks late game, but he doesn't have to be, since he can still just interrupt his channeled abilities. 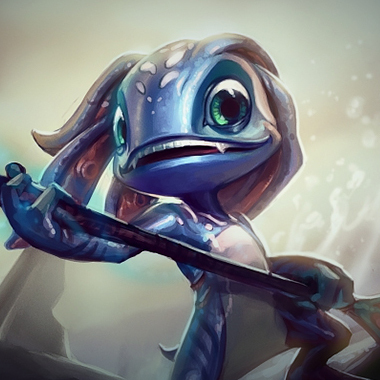 Fizz can just become untargetable from any one of Fiddles abilities and kill him. If he lands the shark then Fiddlesticks just loses the one on one while Fizz three shots him and walks away with his buffs. 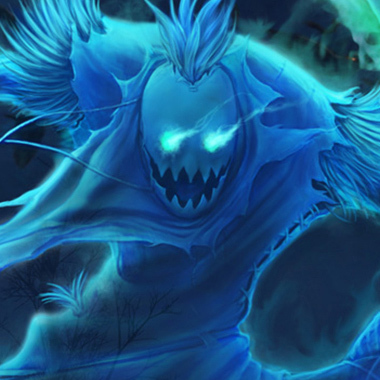 Banshee's Veil is a strong pickup, since Fiddlesticks is 100% reliant on his spells it decreases the amount of damage he does overall. Mercury treads are also a worthy choice for boots, since they'll both give you the magic resist you need and decrease the length of his CC. Otherwise, other MR items are also valuable against Fiddlesticks simply to mitigate his damage.